These are a delicious cake-like chocolate cookie. WARNING! These cookies can be addictive. 2. Mix together all the ingredients together with a mixer, except for the powdered sugar. 3. Cover and chill to firm, about 2 hours in the fridge or 30-45 minutes in the freezer. 4. Roll into tablespoon size balls. 5. 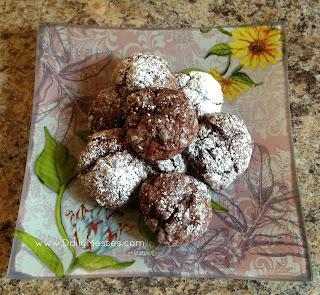 Next, roll balls in powdered sugar and place 2 inches apart on a parchment paper lined cookie sheet. 7. Cool the cookies and dust with additional powdered sugar.